if you played and enjoyed the Battletech board game, you should have some geek fun with this! In addition, it features a 'real-time' element, where the action of the simulation is played out in real-time. 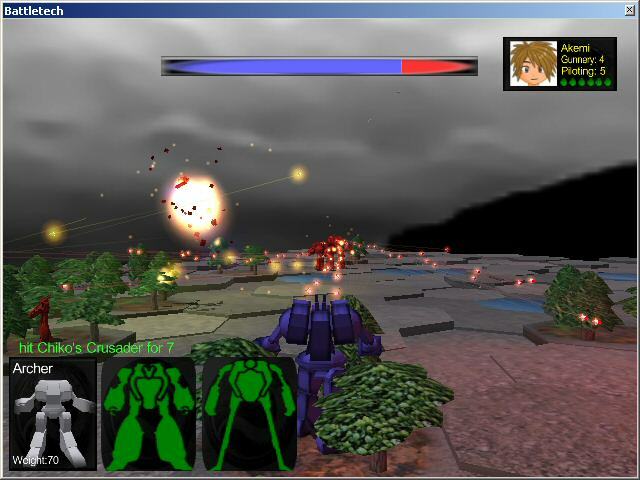 The data in the game is fully moddable, users can create their own mech and weapons, and battle them against each other. Single-player skirmish, one-on-one against the AI, either with random or user-defined teams, on randomly generated maps. Multi-player skirmishes, again either with random or user-defined teams, with both players must use the same PC. Multi-player online support is available from versions 0-0-97 onwards. the 'Add or Remove Programs' in the Windows Control Panel. This application is Beta software, install at your own risk! Click on image below to download latest version (0-1-1). Don't forget to check the Mods page for more downloadable content!